The Gift: Transforming Lives through Organ Donation is a new comic created by the NHS and the University of Dundee aims to get high-school age children and the wider public thinking about the gift of Organ Donation. The comic will be launched to the public on Wednesday 5th September at Dundee Comics Creative Space, Unit 7 in the Vision Building at 7pm. This launch is timed to coincide with the NHS Organ Donation Week in Scotland on Monday 3rd September. The 32 page book, inspired by the tragic death of a University lecturer’s son seven years ago, shares the heartfelt stories and life experiences of individual patients and their families those affected by organ and tissue donation. The Gift was written by recipients of organ donation, the families of donors, and University of Dundee and NHS staff. Over the last seven years, I have had the honour of being an ambassador for the NHS Organ Donation campaign. During this time I have meet courageous and selfless people. But a hard part of this is trying to explain to kids that unfortunately sometimes children die. My own son Andrew died suddenly from a brain aneurism and our family were faced with a challenging decision. We never knew what Andrew’s thought about organ donation were but we did know what kind of loving person he was. Thanks to Andrew’s organ donation, nine people now enjoy a renewed quality of life. For me, being an organ and tissue donation ambassador has provided a platform to tell my son’s story. Now, I hope this comic will do the same. Almost 600 people are waiting for an organ transplant in Scotland at the moment but there are not enough organs to meet these needs and sadly someone dies every day whilst waiting for an organ. We hope that this new comic will raise awareness of the importance of organ donation and prompt honest conversations amongst loved ones. Lots of people think they would be unsuitable to donate organs and tissues because of medical history or lifestyle choices, but each potential donor is individually assessed and we need people from all ethnicities and backgrounds to register. The Gift was published by UniVerse, at the University of Dundee, coordinated by GJRA Member Laura Findlay and produced by Rebecca Horner of Ink Pot Studio. The artists and writers involved in the comic include Mayra Crowe, Damon Herd, Rebecca Horner, Laura Findlay, Chris Murray, Golnar Nabizadeh, Ashling Larkin, Elliot Balson, Catriona Laird, Letty Wilson, Helen Robinson, Megan Sinclair, Philip Vaughan and Norrie Millar. The Gift is the latest in a series of educational comics designed by the University of Dundee’s Scottish Centre for Comics Studies, and produced by Ink Pot Studios, which is based in Dundee Comics Creative Space. It follows on the success of Fibromyalgia and Us (2017), which was downloaded over 12,000 times. Future projects from the University of Dundee’s comics department include comics on heart disease, Coeliac disease, suicide awareness, and disability rights. Comics present a visual narrative, and through the arrangement of sequential panels on a page, and the interaction of words and images, a compelling and engaging narrative can spring to life. The medium of comics relies on a combination of play and problem solving to engage the reader and are an excellent way to communicate complex information and subjective experiences in a relatively straightforward way. In recent years autobiographical comics, many of them dealing with health and disability, have been critically acclaimed, and the research network Graphic Medicine is devoted to comics about health and medical issues. The University of Dundee hosted the annual Graphic Medicine conference in 2016, and this helped to prompt researchers in Comics Studies and various partners, including colleagues from Education and Social Work, Law, Nursing and Health Sciences, Life Sciences, and the Leverhulme Centre for Forensic Science, to work together to produce a series of comics that address important issues. The Scottish Centre for Comics Studies has also recently worked with The Brittle Bone Society, Sistema Scotland/Big Noise Douglas, and various other partners, to produce public information comics. As Dr Laura Findlay, a researcher within the Scottish Centre for Comics Studies, and coordinator of this project adds: “we hope that The Gift helps promote the NHS Organ Donation week, and we extend our thanks and appreciation to all those who consulted on the project and helped create this comic”. GJD2018 Programme: An outline programme with panels, paper titles, and speakers. GJD2018 Full Programme with Abstracts: A more detailed programme containing panels, paper abstracts, and speaker bios. These details, and any updates, also available at the St Franics College website. This post was originally published on the Lancashire Law School Blog here: https://uclanlaw.co.uk/2018/05/24/legal-visualisation-project-tenants-rights/. It is reproduced with permission and thanks. This blog post describes the development of a project to use graphic design principles and techniques to produce a visually engaging guide to tenants’ rights. The project drew on a number of sources of inspiration. Michael Doherty had created OpenLawMap, the world’s first jurisdiction-wide geographical map of legal places, in 2012. This allows users to mark places of legal significance on an online map, to blog about them, and include pictures of the location. It invites users to explore the role of ‘place’ in legal developments (an aspect which is rarely considered) and allows people to see the physical and visual context of important legal events (rather simply textual representations of these events). He developed a legal history walking trail based on OpenLawMap as an induction tool. This model has been adopted by a number of other UK law schools and the overall project won the Routledge / Association of Law Teachers ‘Teaching Law with Technology Prize’ 2015. It led him to explore the wider range of non-textual ways of communicating legal information. There are a number of other legal visualisers, to use Emily Allbon’s phrase , working in the UK. These include Amanda Perry Kessaris who works at the interface of law and design and whose projects include the Pop Up Museum of Legal Objects , the Graphic Justice Research Alliance which promotes research on comics and notions of justice , and RightsInfo, which aims to develop understanding of human rights issues through accessible online resources . The more direct inspirations for this project though came from the US where there are developing practices of using graphic design projects to promote social justice and the public understanding of legal rights. These include NuLawLab at Northeastern University , and Margaret Hagan at Legal Design Lab at Stanford . Hagan has argued the general benefits of design thinking; that it can ‘center our work on real, lived human problems’ and that ‘Design is concerned not so much with the means by which new legal processes may be carried out, but rather with the experience of the humans who will be using these processes’ . infractions of the code are common. When I sought to apply some of this design thinking to a UK legal context, I realised that I would need to work with a graphic designer. I am fortunate to work at an institution that has a vibrant undergraduate research culture and applied for an undergraduate research intern to work on the project for 10 weeks. I was even more fortunate that Chelsea Cully applied. Chelsea is a second year BA Graphic Design student and she quickly grasped the aims and nature of the project. Our next step was to select a topic for legal visualisation. We chose tenants’ rights because it appeared to be the most common issue presenting at law clinics, based on consultation with the Lancashire Law School Clinic and research on Essex and Swansea law clinics by Richard Owen . This also suited the aims of the project because student tenants in shared housing represent an appropriate target audience – we could design the information for them and have a good chance of delivering that information into their hands. Contract commitment – that students were not understanding the nature of a commitment to a (typically) 42-week contract. Damage and repair – it was sometimes a struggle to get landlords to adhere to their legal commitments to make repairs in a timely fashion. Tenant’s noise / litter nuisance – tenants failing to understand their responsibilities sometimes led to conflict with the landlord and neighbours. Privacy – this was an issue that did not arise in Law Clinic referrals but from the student ‘lived experience’ insights. Tenants have a right in law to privacy vis-à-vis their landlord, and in practice this is a right that is sometimes breached, but it is not the sort of issue that a student would necessarily seek legal advice on. Some issues that caused fewer disputes such as deposits, and health and safety regulations (fire, gas, electrical safety) were included because they are so important. Once we had our topic and prioritised list of issues we could start on the graphic design process, including ideas boards, colour schemes, and image banks. This was a challenging brief. We had to summarise a range of legal rights and responsibilities in a way that balanced text and visuals in the most effective way to communicate important information. In the words of Ambrose and Harris we had to make ‘that which is difficult to understand understandable, and that which is uninteresting, engaging’ . Chelsea wanted the urban design of the poster to reflect the types of vernacular architecture of the streets close to the university campus that housed much of this shared accommodation – typically redbrick terraces. I wanted the characters in the poster to move beyond generic figures and look like 21st century undergraduate students. Chelsea explains ‘I sketched and painted houses by hand and used my drawings as a reference for the digital development of this work. The interior of the pamphlet was done in much the same way but with close ups of rooms and different utensils.’ We took our design structure from the Center for Urban Pedagogy, i.e. a fold out poster, but tweaked to make it A3 size which suited the design (and our printing budget better). The process of developing a visual guide to a legal area was a different experience for me from more traditional legal research projects, though the process of summarising complex legal issues and considering how to communicate them in the clearest and most engaging way does cohere with my approaches to teaching and text-book writing. User-centred design – we were not producing a summary of a code, or in this case a bundle of disparate Acts and Regulations. The temptation would have been to take the structure of the law (or even the way it is summarised in Government guides) as the template. We decided we had to approach the design thematically and think about the best way to visually organise the material. This meant that we had a mix of text and infographics in the panel on contract obligations and grouped a range of safety and good practice issues together in our kitchen panel (electrical safety; heat sensor; waste and recycling). Visual representation – the text remains an important part of communicating legal information but at each stage we asked ourselves – how could this be represented visually? What is the right balance between text and images? Distribution – I am hopeful of obtaining external funding to further test and refine the poster before distribution. Even in the absence of this, we will print the poster and work with the Accommodation Office to distribute it to the almost 2000 students currently in University accommodation and to more students through the annual Accommodation Fair. It was enormously gratifying to be able to present this process and poster to colleagues at the Association of Law Teachers conference at Keele, March 2018, and to win the Stan Marsh Prize for Best Conference Poster. It is interdisciplinary in a new and exciting way. It provides different ways of thinking about legal communication. Perhaps most importantly it seeks to have real world impact by delivering accessible information into the hands of people who need it. The poster could be used with very little amendment by other university law clinics and accommodation offices. With some re-design it could be usefully adopted by local authorities, advice centres, and even by housing association or lettings agents. We hope that the project so far is merely the first step. Michael Doherty is a Principal Lecturer in Law at Lancashire Law School. His main interests are in Public Law and in legal education, in non-standard ways of communicating legal information and in public legal education. Chelsea Cully is currently working as a graphic designer in Liverpool on a sandwich year as part of her BA Graphic Design course. R Owen, ‘Law Zone: Digital mapping of unmet legal need’ (Association of Law Teachers Conference 2017, Portsmouth). We are delighted to host the following post from Sregurupriya Ayappan, who is a III year student of law at the National Law School of India University. ‘Calvin and Hobbes’ is a much loved comic strip written by Bill Watterson. It follows the daily adventures of a precocious six year old Calvin and his stuffed tiger Hobbes, who becomes anthropomorphic when they are by themselves, as they often deliberate on issues of philosophy and public interest. One of the recurring themes in the strip is Calvin’s disgruntlement at being made to abide by what his parents, teachers, babysitter Rosalyn or even the bully Moe ask or instruct him to do or not do. Now, I shall show, using various strips, that, Calvin assumes an external viewpoint and feels obliged to do what he is told. For ease, I shall break this down into four components: One, Calvin does not consider himself to be a member of the group and hence, is not subject to the social pressure. Two,he does not accept the rules. Three, he does not use the rules as standards for appraising his own behaviour. Four, he views rules merely as a sign of possible punishment. Who is a member of these Zorkons? – Not Calvin!! As seen in these strips below, Calvin’s fertile imagination creates multiple alter egos, which give an insight into his thought process. The common thread among most of them is that he views himself as differentfrom the rest of the people. In the above strip, he is Safari Al who is threatened by a fearsome gorilla, which is actually his mother instructing him to clean his room. In certain other strips, he dons the persona of Spaceman Spiff, where he views his teacher Miss Wormwoodand the Gym Instructoras aliens (‘zorkons’) who are placing him in a position of mortal peril, forcing him to abide by their instructions. Whose rules? – Not Calvin’s!! There are several strips show that Calvin does not accept the rules which require him to go to bed early, clean his room, or eat lima beans. He feels these rules are an imposition and do not, by themselves, provide any reason for action. This is evident, as he brands his parents as ‘communists’ and accuses them of ‘totalitarianism’. He also questions the legitimacy of the imposition of rule by pointing out that he was never consulted, and that his acceptance was never sought. He is subject to these rules due to the compelling factor of being born to his parents. Who thinks rules are a standard for conduct? – Not Calvin!! In the above strip, it can be seen that Calvin exploits the opportunity to play hooky from school. In one other strip, he does not change his habit walking across the floor with his boots on. He does not appraise his conduct against the rule of taking them off either, and merely abides by them after violating it at the reminder, since it contains within itself the possibility of punishment. In yet another strip, he views his sudden power of invisibilityas a means of freedom to violate the rule of not taking cookies and is ecstatic that he can get away with anything. He clearly does not criticise or examine his actions against the established rules or view them as standards of conduct. Why follow rules? – Meep! Punishment! As it is clearly seen in these strips, Calvin yields to the rules onlyat the prospect of potential punishment. In the above strip, he submits to Rosalyn merely because she threatens to call the emergency numbers provided, a scenario which Calvin wants to avoid. So, he retires to bed early. In some other strips, it is clearly seen that Calvin changes his mind when his parents raise their voiceat him. He does not see the merits of the rules or wishes of his parents and continues to stick to his stance until he fears their possible reactionswhen he realises they have lost their temper. Hence, for Calvin, rules are merely signs of punishment and only have predictive value. [i] H.L.A. Hart, The Concept of Law, 82-91 (2ndedn., 2007). See alsoScott Shapiro, What is the Internal Point of View?, 73(3) Fordham Law Review, 1157 (2006); John Ferejohn, Positive Theory and Internal View of Law, 10(2) Journal of Constitutional Law, 273 (2008). The Graphic Justice Research Alliance (GJRA) is delighted to announce a call for papers for its 2018 annual conference at St Francis College in Brooklyn, NY. The conference will be held on 20 October 2018, and promises to be an exciting event that is accessible and relevant to scholars, artists, practitioners, policy-makers, writers, and the general public alike. The GJRA is a multidisciplinary research network exploring the crossover between law and justice and comics of all kinds. 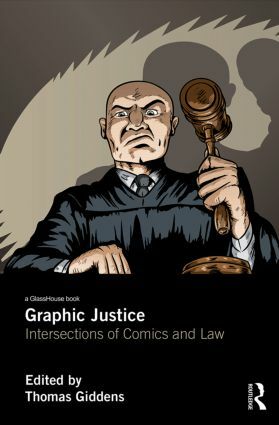 The theme for the 2018 Graphic Justice Discussion is ‘Law, Comics, Justice.’ Figured broadly, this theme draws attention to the connections and ruptures between and among each of these elements, in theory and in practice, as well as the ways in which they are invoked across cultural, institutional, public, and private domains. In this way, it continues some of the conversations from the inaugural conference in 2017, while exploring new trajectories and avenues of inquiry. Participants may submit abstracts to present a paper, conduct a workshop or interviews, or a poster presentation. Papers will be allocated up to 20 minutes by default. Please include a bio-note of up to 150 words with all submissions. Registration: $20 for GJRA members, and $25 for non-members. Students admitted free. Payment can be made in cash on the day of the conference. If you have any queries, please don’t hesitate to let us know. We look forward to hearing from you. For more information about joining the GJRA, including how to become a member, click here. Sign up for the mailing list, including the quarterly Memo direct to your inbox. Join the GJRA: You will be added to the mailing list, and your details included in the Membership database.